Diesel is ready to challenge conformity once again by partnering with global superstar DJ/producer and fashion and tech entrepreneur, Steve Aoki, as its watch ambassador into 2019. To kick off the collaboration, Steve will be the face of Diesel’s first transparency watch collection, available fall 2018. For fall 2018, Diesel is reimagining the status quo and introducing the brand’s first bold collection of blue transparency watches. Drawn from the indigo dyeing of jeans, blue transparency is a natural design evolution for Diesel, a brand rooted in denim culture. The new watch styles display vintage cream pops on dials, inspired by denim stitching. Transparent cases and straps that fade from blue to crystal clear complete the original design story. Diesel’s 2018 watch campaigns featuring Steve Aoki were shot by famed French photographer and publisher Philippe Jarrigeon and were styled by Justin Lynn. The global multimillion-dollar campaign, supporting multiple watch categories, will debut throughout the year. Fashion designer Kate Spade has committed suicide by hanging. She was 55. According to the Associated Press, Spade was found dead by her housekeeper in her New York apartment the morning of June 5, 2018. She reportedly hanged herself with a red scarf and left behind a suicide note saying that her 13-year-old daughter, Frances Valentine, should not feel guilty over the death. At the time of the suicide, Frances Valentine was reportedly at school, while Kate’s husband Andy was at their home in another room. Kate Spade (whose maiden name was Brosnahan) was an accessories editor at Condé Nast before she decided to become a fashion designer. She married Andy Spade (the brother of actor David Spade) in 1994, the year after the couple founded the fashion company Kate Spade New York, which was followed by the men’s brand Jack Spade. The Kate Spade New York brand became known for its accessories (especially handbags) and then women’s clothing. In 1999, the Spades sold 56 percent of Kate Spade New York to Neiman Marcus for $34 million, and sold the remaining share to the company in 2006 for a reported $59 million. Kate Spade New York was sold again in 2017 to Coach’s Tapestry Inc. for $2.4 billion. The Kate Spade New York brand currently has 315 stores around the world, including 140 in the United States. In 2015, Kate launched another fashion brand, Frances Valentine, named after her only child. The Council of Fashion Designers of America (CFDA) awarded Kate Spade with two prizes: America’s New Fashion Talent in Accessories in 1996 and Best Accessory Designer of the Year in 1998. Andy Spade issued this public statement: “Kate was the most beautiful woman in the world. She was the kindest person I’ve ever known and my best friend for 35 years. My daughter and I are devastated by her loss, and can’t even begin to fathom life without her. We are deeply heartbroken and miss her already,” Andy’s statement began. “Kate suffered from depression and anxiety for many years. She was actively seeking help and working closely with her doctors to treat her disease, one that takes far too many lives. We were in touch with her the night before and she sounded happy. There was no indication and no warning that she would do this. It was a complete shock. And it clearly wasn’t her. There were personal demons she was battling. Casio America, Inc. has announced the release of the latest addition to the BABY-G line of women’s shock-resistant watches, based on the concept of “Tough and Cool.” The BGA190KT is a collaboration model inspired by a globe-trotting Hello Kitty and will be available in two models. The base model for the collaboration model is the BGA190, which is popular among avid travelers for Dual Dial World Time that simultaneously shows the time in two cities. Inspired by a globe-trotting Hello Kitty, the watch is designed to appeal to women who enjoy traveling. This is the second BABY-G collaboration timepiece with Hello Kitty. 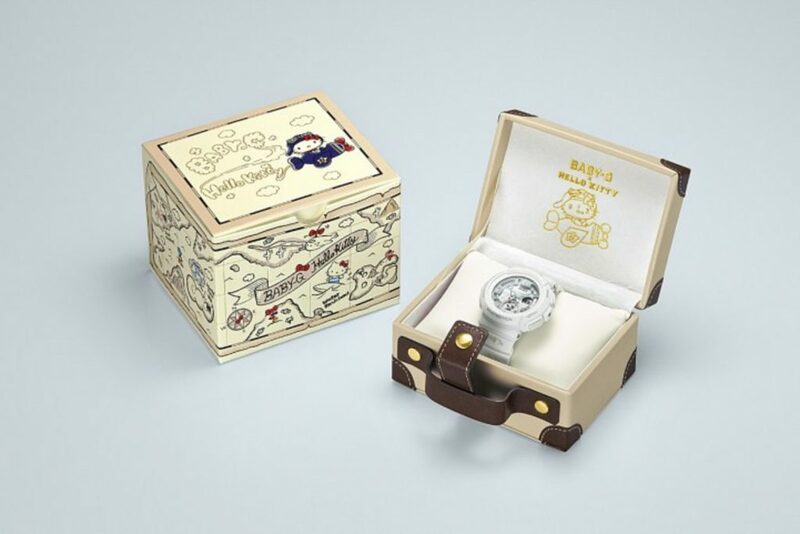 The minute hand is decorated with Hello Kitty’s trademark red ribbon, and the watch band is covered with Hello Kitty-style illustrations arranged like random passport stamps, to set the mood for travel. The back plate and special packaging feature an originally-designed pilot Hello Kitty to commemorate the collaboration. The BGA190KT is designed to inspire travel, extending to the special packaging that includes a box styled like a suitcase that is essential for every trip. The special Hello Kitty BABY-G collaboration watch is available in two colorways, white (BGA190KT-7B) and black (BGA190KT-1B), and is equipped with shock- and water-resistance up to 100 meters, world time, daily alarm, stopwatch, and countdown timer capabilities, LED light, and 12/24 hour formats. The BGA190KT will retail for $150 and will be available at Macy’s, select fashion boutiques, shopcasio.com and at the G-SHOCK Soho Store. For more information about these women’s analog-digital watches, visit http://www.baby-g.com/. Casio America, Inc., Dover, N.J., is the U.S. subsidiary of Casio Computer Co., Ltd., Tokyo, Japan, one of the world’s leading manufacturers of consumer electronics and business equipments solutions, established in 1957. Casio America, Inc. markets calculators, keyboards, digital cameras, mobile presentation devices, disc title and label printers, watches, cash registers and other consumer electronic products. Casio has strived to realize its corporate creed of “creativity and contribution” through the introduction of innovative and imaginative products. For more information visit our website at casio.com/home. 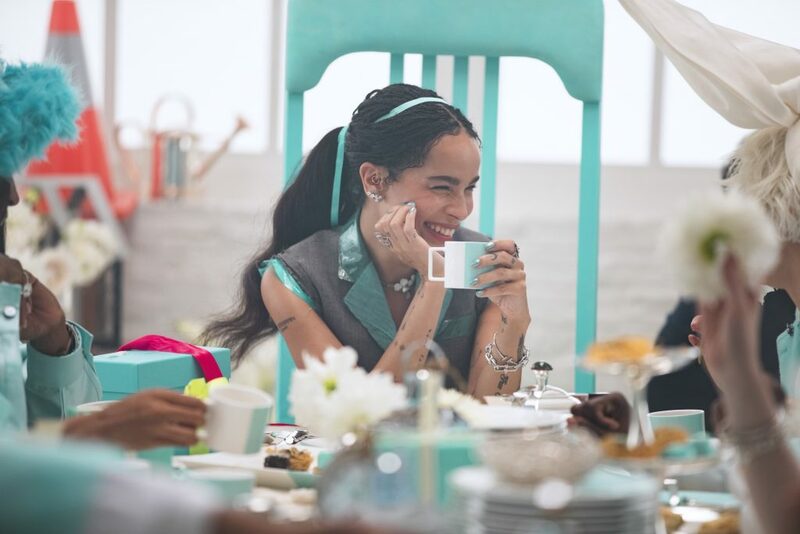 Alex and Ani, the beloved lifestyle brand that creates meaningful, eco-conscious jewelry to positively empower and connect humanity, today announces a new, cosmically-inspired capsule: Disney’s A Wrinkle In Time Collection by Alex and Ani. 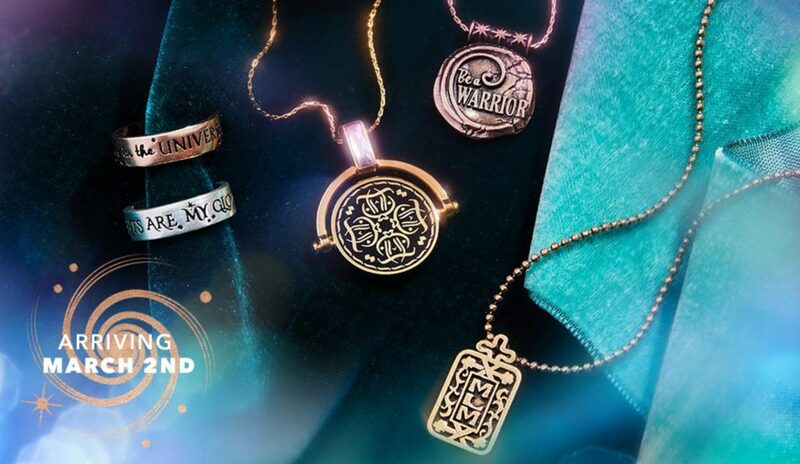 Available Friday, March 2, 2018, the 19-piece collection includes necklaces, bracelets and rings inscribed with iconic quotes and magical symbols from the cherished story of one young girl’s epic adventure. Hand-crafted with intention in Rhode Island, all Alex and Ani accessories harness power and meaning through symbolism, providing a vehicle for the wearer to express his or her individuality. Be it the magical flowers from the planet Uriel or the inspiring words from Mrs. Who, Mrs. Which and Mrs. Whatsit – every piece from Disney’s A Wrinkle In Time Collection by Alex and Ani is meant to speak to one’s heart, unleashing the triumphant powers of love and light. Disney’s A Wrinkle In Time Collection by Alex and Ani will be available online at www.alexandani.com and at Alex and Ani stores around the world, as well as select retail locations. See below for descriptions of the full collection and be sure to share your journey on Instagram @ALEXANDANI. The ALEX AND ANI brand creates meaningful, eco-conscious jewelry and accessories to positively empower and connect humanity. Carolyn Rafaelian, Founder, CEO and Chief Creative Officer designs each piece. Carolyn believes that every individual has their own positive energy to share with the world. By incorporating powerful symbolism and personal meaning into each product, ALEX AND ANI provides a vehicle for consumers to express their individuality. ALEX AND ANI is committed to giving back to the world that we live in. The company is passionate about the wellbeing of our planet, our communities, and our individual paths. ALEX AND ANI uses recycled materials with eco-conscious processes and through their CHARITY BY DESIGN division, ALEX AND ANI positively impacts our planet and our communities. CHARITY BY DESIGN has strengthened non-profit organizations through innovative partnerships and collaborative experiences resulting in donations of over $50 million. An Inc. 500 Company, ALEX AND ANI has retail stores in addition to retail partners worldwide. The company’s World Headquarters is located in the greater Providence, Rhode Island area. Please visit www.alexandani.com for more information. Coach, Inc. announces Selena Gomez as the face of Coach in the brand’s Fall 2017 advertising campaign. The multi-talented singer, actress, producer and philanthropist captures the all-American optimism of Coach in a series of images set in New York City. Sarah Jessica Parker is opening a SJP by Sarah Jessica Parker boutique this summer at the Bellagio Resort & Casino in Las Vegas. It will be the second SJP by Sarah Jessica Parker store and the first on the West Coast. The first SJP by Sarah Jessica Parker opened in December 2016 at Bellagio’s sister property MGM National Harbor in Oxon Hill, Maryland. The boutique will be located in the Promenade retail corridor, taking the place of La Scarpa, which will close in mid-May. SJP was founded in February 2014 by Sarah Jessica Parker and partner George Malkemus III. The footwear and accessories collection stems from Sarah Jessica’s love for the single sole and vivid memories of New York City fashion in the latter part of the ’70s. DSW (Designer Shoe Warehouse) has teamed up with TREND: BAR to give customers the opportunity to add embellishments to their footwear and accessories at select DSW locations. According to a press release, Los Angeles-based TREND: BAR, founded by sisters Lindsey and Kayla Swartz, produces luxe fabric stickers, appliques, charms, shoelaces, patches and creative add-ons that customers can use to personalize their footwear and accessories. To celebrate the launch of this partnership, DSW will be hosting special events on March 12, 2017, with TREND:BAR helping customers discover the perfect add-on for their new shoes, plus music, snacks, and more. More information can be found at DSW’s official website. 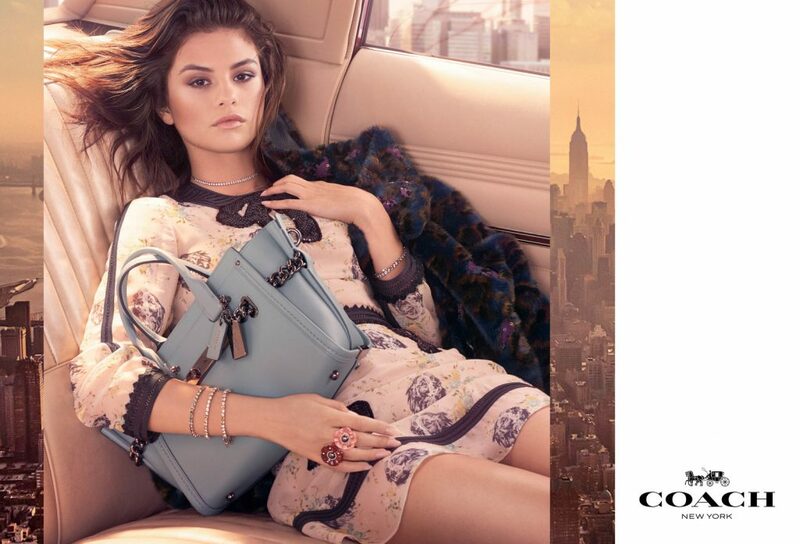 Singer and actress Selena Gomez has signed a deal to represent the accessories/lifestyle brand Coach, She will appear in Coach’s fall 2017 fashion campaign. Her partnership with Coach will also include a special design project with Coach executive creative director Stuart Vevers, as well Gomez teaming up with Coach Foundation in its support of Step Up, a national organization dedicated to the empowerment of underprivileged teenage girls.